﻿ Paleo Blueberry Pancake by Street Organics - I AM Co. Here at I AM Co. one of our favourite things to do is enjoy visiting the great cafes around the country. We’re so spoilt to have such an amazing range of cafes serving some hugely delicious, healthy food from a wide variety of cultures. Some of these cafes have been generous enough to share some of our favourites with you…. With the massive and inspiring trend towards organic food worldwide, Street Organics serve a range of organic snacks, meals and drinks to dine in or take away. They make from scratch and retail some of their most popular products like fresh almond milk, bone broth, cakes, treats, probiotic drinks and take-home meals for quick and easy healthy solutions. 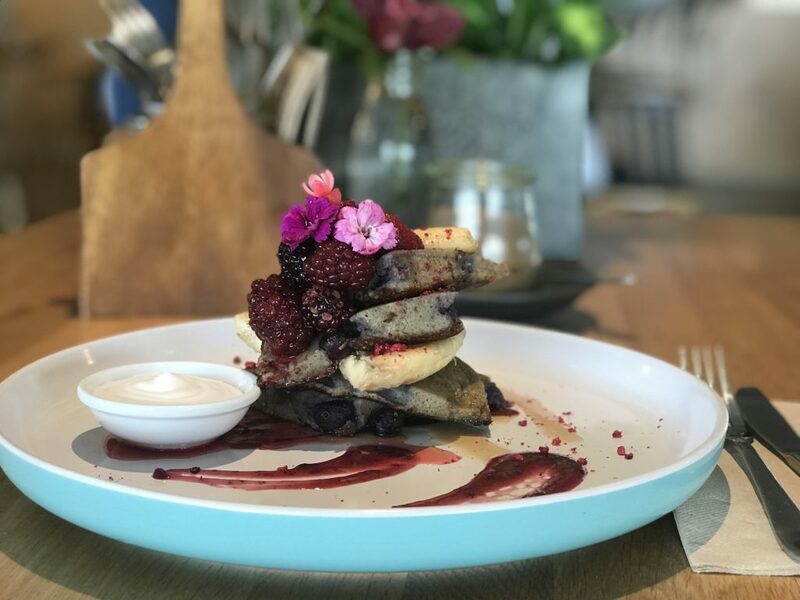 They also host regular dining and wellness events, including a vegan high tea and feasts which are popular with non-vegans alike! be sure to check then out today! 1) Heat oven to 180 degrees celsius. 2) Blend all ingredients thoroughly (or mash well with a fork until fully combined). 3) Add a teaspoon of butter to an oven-proof fry pan* on medium heat. 4) Pour ½ the batter into hot pan. 5) After about 1 minute, or when top of pancake starts to dry out, place frypan in oven for 5 minutes or until lightly golden on top. 6) Remove from oven and turn out onto plate. 7) Repeat with the rest of the batter. Serve with berry compote, (mixed berries heated with a little maple syrup), and coconut yoghurt. * If you don’t have an oven proof frypan, you can carefully flip the pancake to cook the other side. 1 Byron Ave, Takapuna, Auckland.